The MainActivity class extends a class that belongs to Android’s SDK library, namely, the AppCompatActivity class. In other words, the MainActivity object is an AppCompatActivity object. The MainActivity object has all the rights and responsibilities that any AppCompatActivity instance has. For example, the MainActivity has an onCreate method, which it override. In fact, the MainActivity class inherits about 460 lines of code from Android’s AppCompatActivity class, which inherits about 1,000 lines from Android’s FragmentActivity class, which inherits about 6,700 lines from Android’s Activity class. The inherited methods include ones such as getCallingActivity, getCallingPackage, getParent, getTitle, getTitleColor, getWindow, onBackPressed, onKeyDown, onKeyLongPress, onLowMemory, onMenuItemSelected, setTitle, setTitleColor, startActivity, finish, and many, many others. You inherit all this functionality with two simple words: extends AppCompatActivity. In the terminology of familial relationships, your MainActivity class is a descendant of Android’s Activity class. Your MainActivity class is a kind of Activity. 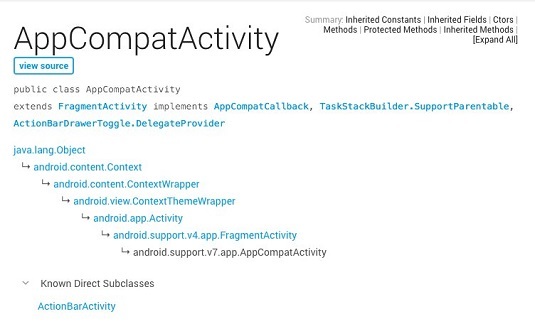 This image, taken directly from Android’s online documentation, summarizes this information about the AppCompatActivity class. Bookmark the page for easy access to Android’s API library documentation. In addition to being a subclass, the AppCompatActivity class implements a bunch of interfaces, including the AppCompatCallback interface, the TaskStackBuilder interface, and others. You don’t have to remember any of this. If you ever need to know it, you can look it up on Android’s documentation page. The word super stands for the superclass’s constructor. Different code used the super keyword in a different ways. Yes, super always has something to do with a class’s parent class. But, no, super doesn’t always refer to the parent class’s constructor. In an onCreate method, the call super.onCreate(savedInstanceState) sends savedInstanceState to the parent class’s onCreate method. The parent class is the AppCompatActivity class. So Java calls the AppCompatActivity class’s onCreate method. The AppCompatActivityclass’s onCreate method contains its own call to super.onCreate(savedInstanceState). The AppCompatActivity class’s parent is the FragmentActivity class. So Java passes savedInstanceState to the FragmentActivity class’s onCreate method. And so on. It’s not until you get to the Activity class — your MainActivity class’s great-grandparent — that the code makes direct use of the savedInstanceState variable. From this savedInstanceState information, the code puts the activity back the way it was before the system destroyed it. Narrowing means trying to assign a long value to an int value. A long value has 64 bits, and an int value has only 32 bits. So the attempt at narrowing fails. In the code you find here, the bad findViewById call is another attempt to do narrowing — assigning the View value returned by a method call to a TextView variable. The TextView class is a subclass of the View class, so the assignment fails miserably. appease the Java gods by adding a casting operator to the code. You tell Java to convert whatever pops out of the findViewById method call into a TextView object. you verify that the name textView represents a TextView widget. When the app runs, Java grabs the R.id.textView widget from the activity_main.xml file, and everything works just fine. But you may sometimes forget to check your R.java names against the components in the XML file. A call to findViewById surprisingly spits out a Button component when your casting tells Java to expect a TextView widget. When this happens, Java chokes on the casting operator and your app crashes during its run. Back to the drawing board!